CRUSHER MAINTENANCE 70 E&MJ • JUNE 2018 www.e-mj.com ply or rebuild the following parts: a new hopper assembly, reconditioned spider with CMS Cepcor parts, top-shell (including wear pats), main shaft assembly (including wear parts), new eccentric assembly, pinion shaft assem- bly, reconditioned hydroset assembled with CMS Cepcor parts, new dust collar assembly, reconditioned bottom shell, and a support frame with guards and a new motor. CMS Cepcor said the entire rebuild and conversion process was completed in accordance with its Lloyd's Register ISO quality system, which included the full assembly of the crusher at the Coalville facility prior to shipping. All of this had to be managed to meet the mine's challenging deadline for expansion of their pro- cessing circuit. Standing more than 5 meters tall once assembled and weighing more than 35,000 kg, the crusher has an im- posing presence for a secondary cone crusher. With extensive expertise in rebuilding a wide range of worn components used in crushing equipment, CMS Cepcor said it can offer these services to convert any of the following models from Hydrocone type to Superior type (or vice-versa) using off-the-shelf stock components. Concaves Engineered for Better Wear When it comes to selecting concave alloys, Columbia Steel sug- gests using the hardest alloy that will withstand the specific impacts for the gyratory crushing application. They said concave selection depends on the compressive strength, toughness and friability of the material being crushed. For example, crushing some tough materials demands work-hardening manganese steel. If there is insufficient impacts to cause the surface to work harder, the same liners used for an abrasive, friable ore may wear quickly. COMPANY PROFILE-PAID ADVERTISEMENT Henkel Corporation Henkel Adhesive Technologies is leading with high-impact solutions worldwide. We lead today's and build tomorrow's markets with our unique portfolio of breakthrough innovations, tailor-made solutions and strong brands in adhesives, sealants and functional coatings. We combine innovation and technology leadership and close customer partnership to deliver solutions that are an essential part of countless industrial and consumer goods. We utilize our global presence and our expert knowledge to offer a winning combination of best-in-class service and lead- ing technologies to customers and consumers around the world. 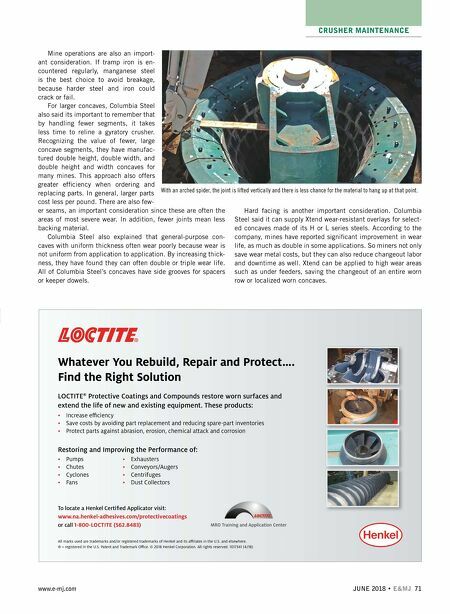 Backed by the powerful LOCTITE ® products, we provide solutions to industry's biggest challenges. We have solutions for all your Maintenance Challenges. Maximizing your production, minimizing unplanned down- time, and preventing equipment failures are critical in every industry. Unreliable equipment can lead to lost time, expen- sive repairs, and safety issues that can seriously affect your bottom line. At Henkel, we understand the challenges you face because we have long-term experience maintaining industrial equip- ment. Henkel and our LOCTITE brand are the trusted partners of industries around the world to help reduce costs, increase reliability and improve efficiency. 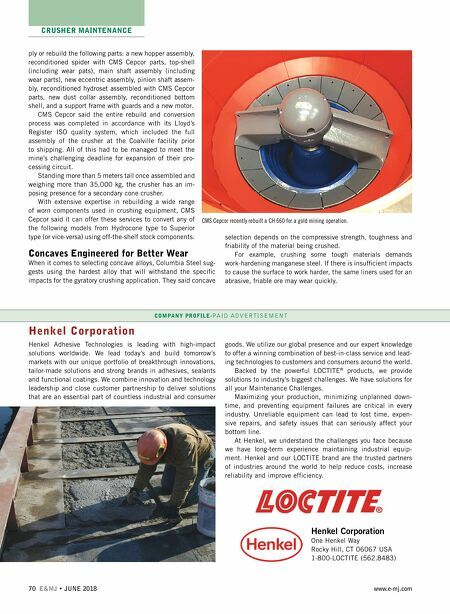 Henkel Corporation One Henkel Way Rocky Hill, CT 06067 USA 1-800-LOCTITE (562.8483) CMS Cepcor recently rebuilt a CH 660 for a gold mining operation.